As your little one begins to walk and crawl, they are yearning for freedom. Are you worn out from chasing them about? Tired of constantly saying "No"? 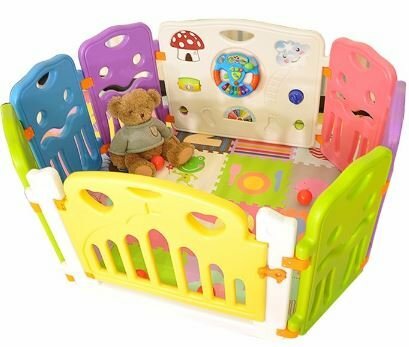 The Flexible Play Yard from Lil' Jumbl is your perfect solution! Keep your toddler restricted to a safe area, while still allowing them to explore the world around them. This six-panel set is ideal for both indoor and outdoor play. Its sturdy design is guaranteed to contain your little one, with suction cups on the bottom edges for extra stabilizing support. The hinged gate panel features a safety lock, which allows you to easily walk in, but won't let your child get out without assistance from an adult. A special play panel offers additional fun for your toddler to interact with spinners, shapes and a steering wheel that produces exciting sounds and light action.